The changes came unbelievably fast. On January 1, 1943, the U.S. 8th Army Air Force in Britain numbered six bomb groups and one fighter group. Twelve months later the lineup had expanded to 26 bomb groups and 10 fighter. But even that was incomplete. Through 1944, the Eighth trailed its contrails across all of Europe, from Scandinavia south and eastward on long-range shuttle missions that included stops in Russia. It was the year of decision in Europe, not only with D-Day, but with a sustained bombing campaign unlike anything before or since. The Eighth’s origins were humble and hasty. Three weeks after the Japanese attack on Pearl Harbor, the organization was activated without aircraft at Savannah, Georgia, with headquarters established at Bolling Field, D.C. Maj. Gen. Carl Spaatz established the Eighth at Bushey Park southwest of London in June 1942. However, a pioneering cadre had arrived in February. Brigadier General Ira Eaker and six officers laid the groundwork for Spaatz and others who would follow. The small group included future combat leaders: Lt. Col. Frank Armstrong, Maj. Peter “Bud” Beasley, and Captains Fred Castle and Beirne Lay. Castle would perish as a brigadier general and Lay became the Eighth’s chronicler in print and on screen. 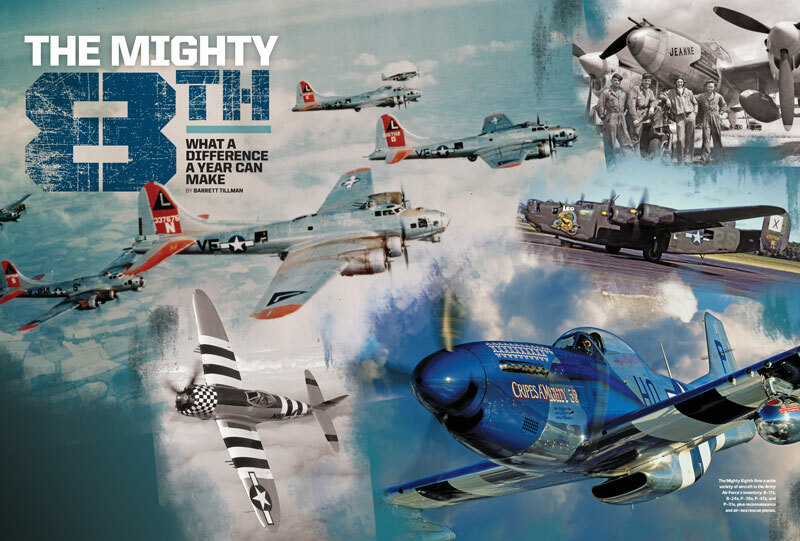 The Mighty Eighth was America’s strategic air force in the European Theater of Operations (ETO). But before U.S. airmen could begin bombing Occupied Europe, immense logistics and doctrinal-operational hurdles had to be cleared. Eaker took over the Eighth from Spaatz in December, and Job One was establishing more than 200 bases and the vast support organization necessary to sustain an air campaign. Therefore, he and Spaatz had to work hand in glove with the British, and it was not always easy. To read the article from the December 2014 issue of Flight Journal. click here.